Trials to qualify the flight deck of the first-of-class FREMM frigate were conducted in early February and supervised by the DGA. French Navy test pilots completed several series of approaches and as many as 50 deck landings with a Lynx five-tonne class helicopter. The operations were a complete success. In particular, the pilots appreciated the absence of turbulence above the flight deck in all landing positions. "This qualification milestone further demonstrates the excellent progress we are making on the programme," said Vincent Martinot-Lagarde, FREMM programme manager. "DCNS teams stepped up their efforts to ensure that all the equipment needed for deck landing trials on the vessel was ready ahead of the initial schedule. This first qualification of the FREMM flight deck was initially planned to take place after delivery." As well as the high quality of the safety, communication and navigation systems used for helicopter approach, landing and handling operations, the DGA teams and French Navy crew appreciated the intuitive layout of the flight deck control room used to coordinate helicopter operations. The control room was designed with the aid of 3D tools and offers unprecedented levels of comfort and usability. 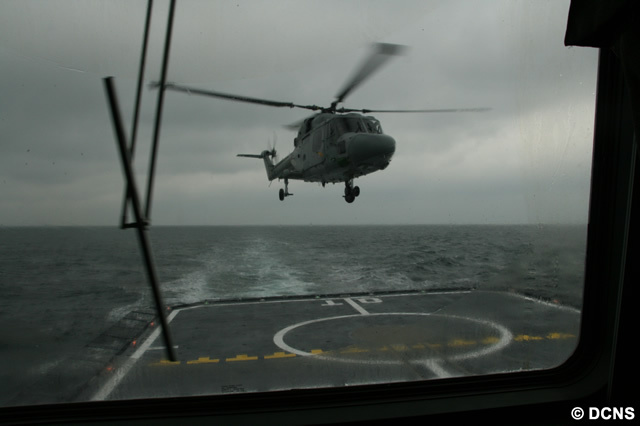 Thanks to the concerted efforts of all the teams involved, FREMM frigate Aquitaine has demonstrated its ability to launch and land Lynx helicopters. The vessel's hangar area is designed to accommodate one of the NH90 Caiman heavy lift (10-tonne class) helicopters now in service with the French Navy. The first deck landing trials with a Caiman will be conducted in the coming weeks.